Alison joined the SISCC team, in 2017, as a highly experienced post-doctoral researcher and is currently developing and will lead the evaluation of the Evidence-into-Practice approach to support improvement planning within neonatal units, under the maternal and child health (MCH) work stream. This work will use a realist approach, to understand whether this approach has worked and if so - where and for whom. Alison is a highly experienced social and health researcher, with a depth of knowledge and expertise in the field of substance misuse - in particular around injecting drug use, blood borne viruses and alcohol use research. She brings substantial experience in conducting evaluation and outcome research using various research methods. She is a reviewer for the NIHR and for a number journals, and is a member of several steering groups and committees for drug related work and research in Scotland. Alison’s recent research has included as a co-investigator on an NIHR funded study that examined the feasibility of delivering a tailored intervention to reduce the harms associated with injecting to people who inject drugs (PWID). Until recently, she also managed the Needle Exchange Surveillance Initiative, a large scale biennial survey that monitors the prevalence and incidence of blood borne viruses among PWID across Scotland. In the past, Alison managed a large scale survey of all prisoners in Scotland to examine the incidence and prevalence of hepatitis C amongst that population. She has also conducted research on a large-scale peer intervention for the prevention of cannabis smoking in school aged students, and evaluations of training programmes for nursing staff who provide care to people with alcohol, drugs and mental health problems. She is currently the Principal Investigator on a grant from the Chief Scientist Office to conduct an in-depth study of Novel Psychoactive Substance injecting in Scotland. The study will primarily investigate the risk taking behaviours and service utilisation of people who inject NPS. 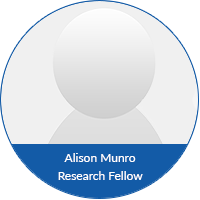 Alison is currently co-supervising three PhD students who are conducting qualitative studies in the areas of naloxone, drug policy and barriers to treatment for hepatitis C.